Shawn Hennigan, M.D. will perform the procedure. 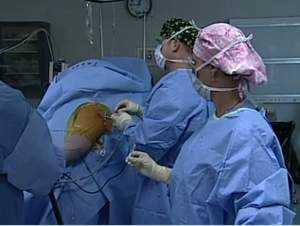 His technique uses multiple small incisions (portals) and arthroscopic technology to visualize and repair the rotator cuff. The technique is very challenging and the learning curve for orthopedic surgeons who perform this technique is steep. Dr. Shawn Hennigan is one of only three orthopedic surgeons in the state of Wisconsin who have completed fellowship training in shoulder and elbow surgery. Expert commentary throughout the broadcast will be provided by Jon Henry, M.D., a fellowship-trained sports medicine orthopedic surgeon, Robert Limoni, M.D., and Michael Schnaubelt, M.D. BayCare Clinic's chief medical officer, Paul Summerside, M.D., will provide additional perspective on athletic injuries. Arthroscopic Rotator Cuff Repair is indicated for a rotator cuff tear that does not respond to non-operative management and is associated with weakness, loss of function and limited motion. The rotator cuff is a group of four muscles that surround the humeral head -- the ball of the shoulder joint. The muscles are referred to as the "SITS" muscles -- Supraspinatus, Infraspinatus, Teres minor and Subcapularis. The muscles function to provide rotation and elevate the arm and give stability to the shoulder joint (glenohumeral joint). The supraspinatus is most frequently involved in degenerative tears of the rotator cuff. More than one tendon can be involved. There is a bursa (sac) between the rotator cuff and acromion that allows the muscles to glide freely when moving. When rotator cuff tendons are injured or damaged, this bursa often becomes inflamed and painful. Operative treatment of a torn rotator is designed to repair the tendon back to the humeral head (ball of joint) from where it is torn. Join Dr. Shawn Hennigan for a live arthroscopic rotator cuff <br>repair webcast from Aurora BayCare Medical Center on OR-Live.